Wales Under-20 coach co-ordinator Allan Lewis said his side's ill-discipline proved costly as they lost to Scotland in the Six Nations. The visitors led 24-12 at one stagel but Scotland fought back in the second half to record a narrow 36-34 win. Wales had beaten England in their opening game but Lewis was left disappointed by defeat at Netherdale. "We've just got to be more disciplined," Lewis said. "Credit to Scotland, they played well, but having said that I just felt the discipline with us wasn't good enough on occasions. "It could be when you're under pressure you tend to do that. They're still young men but that's no excuse. "But I take my hat off to Scotland - they did a job tonight." 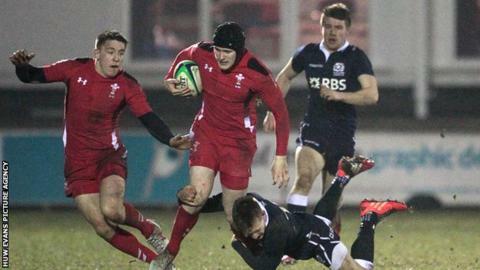 Tom Phillips, Dafydd Howells, Joshua Adams and Garyn Smith's first half tries put Wales in control. George Horne kept Scotland in touch and Murray McCallum's try at the end of the first half reduced the deficit. Tries from Lewis Carmichael and Zander Fagerson saw Scotland take control and although Adams scored a second try the home side held on. Wales next face France, who lost their second game of the campaign in Ireland, on 28 February and Lewis wants to see an improvement. "With France they're a big side and a big outfit and carry the ball hard," Lewis said. "If we are as undisciplined as [we were against Scotland] and our defence isn't secure then we could have a hiding out there. "We have to pick up our game incredibly and bring it back to where it was last week [against England]."